Being extremely diverse in HTML themes conversions, we provide the best PSD to WordPress services to global customers. It is the most popular CMS and an outstanding platform for blogging with over 20 years of development history. That is why it is so widely used as a base for absolutely different online portals. And we just cannot but help you with managing your WP site. We have 6+ years of experience as PHP developers. WordPress system is built with this language and MySQL. During this time we've implemented various development and design projects for WP sites and improved our expertise significantly. Currently we are able to accomplish all possible tasks related to this CMS that your site may require. There are numerous benefits of using this system. It's been developed over many years and has produced certain results which we can enjoy today. It is an open-source, highly secure and customizable platform with a flexible structure and lots of extensions. A huge community of its adepts and programmers makes contributions to improve the platform daily. Being suitable for any kind of site, even eCommerce one, this CMS is greatly appreciated by business owners. Why PSD to WordPress theme conversion is beneficial for site owners? The platform is very easy to operate. It allows concentrating on content, rather than on coding. Since users pretty much don't care what you do with the back-end inside the app, what they want is your content. That's why timely updating the information and multimedia on your site is so crucial. Professional HTML conversion of PSD files is among the cost-effective and time-saving solutions for it. 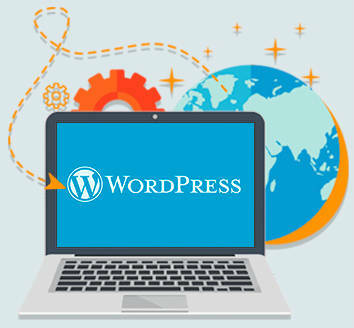 Apart from converting some parts of the content, we offer you to create a theme for your site by means of PSD to Wordpress conversion. There are thousands of ready-made Wordpress templates you can purchase or download for free. However, the unique design is much more powerful if you want to stand out from the competitors. We can transfer your own Photoshop design to the web or create a custom WordPress template just for your needs! No matter what volume of work you request. Whether it's PSD to WordPress or any other programming task, we focus resources to bring well-developed responsive sites that correspond your business goals as the final result. What are the advantages of building your site on WordPress? 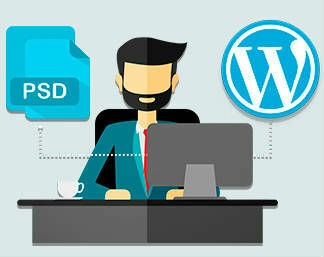 Why you can entrust us with coding of your PSD to WP? We want you to be as passionate about your project as we are. To involve you in the process of conversion even more, we offer you a 5 step scheme of our action plan below. We overview your query and files that you provide us with. We reach out to you to discuss the project and requirements. We segment your designs to smaller picture elements. Now when the files are splitted, coders can convert them to HTML. We test the converted pages on different devices and browsers.